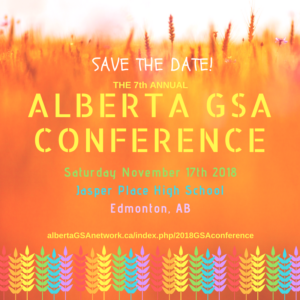 The Alberta GSA Conference is an annual free conference for k-12 students & school staff in Alberta. The conference provides workshops & resources aimed to help students and school staff start, strengthen, and maintain GSA clubs in their schools. Keep updated by checking this page! Free tickets for students & school staff will be available via Eventbrite the 3rd week of September 2018. For information about the previous conferences check out the Alberta GSA Network blog posts for the 2017 Alberta GSA Conference & the 2016 Alberta GSA Conference.